The NBA returns on Christmas Day with a gift of 5 NBA games for basketball fans. 3 of the 5 NBA Christmas Games will be available to watch live online, so if you find yourself away from the TV you can still catch the action online. The Knicks and Celtics airs live on TNT and will be available online via TNT Overtime Extra, while the Magic vs Thunder and Clippers vs. Warriors will air on ESPN and be available online through ESPN3. The Miami Heat and Dallas Mavericks (2:30 PM ET) and the LA Lakers vs. Chicago Bulls (5:00PM ET) will air on ABC and are not available online. 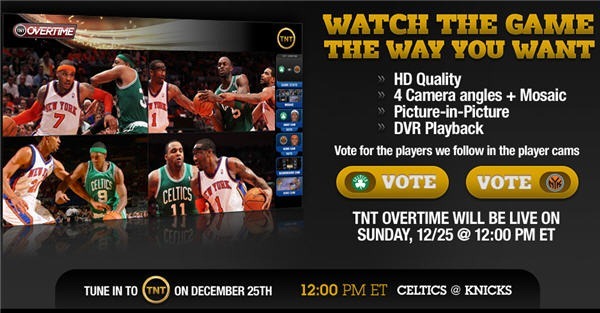 TNT returns Overtime Extra for the 2011-2012 season. Intended to be a supplement to the TV broadcast, Overtime Extra delivers 4 different camera angles, picture –in-picture, and DVR playback along with the TNT broadcast commentary. Dwight Howard is still a member of the Magic (as of 12/22/2011), and he’ll go head-to-head with Kevin Durant and the Oklahoma City Thunder Christmas Night at 8:00PM ET. The LA Clippers promise to be one of the more exciting teams in the NBA with the addition of Chris Paul to a lineup that already featured the highlight heavy play of Blake Griffin. Tip-off time is 10:30 PM ET / 7:30 PM PT.